It should be said at the outset that the actual likelihood and systemic consequences of a default by a major counterparty, would depend, to an important degree, on the systemic importance of such a counterparty. The more important the function played by an institution, the more likely it is to be considered by regulators to be "too big to fail" or "too complex to unwind". Thus, a systemically important institution would be more likely to trigger intervention from the regulatory authorities to prevent a disorderly liquidation that may imperil the broader financial system. Indeed, this is what happened with Bear Stearns, when the Federal Reserve and JPMorgan Chase stepped in to save it from collapsing. The largest CDS dealers are highly rated securities firms and banks, which play systemically important roles in the efficient functioning of the financial markets. ... In Moody’s opinion, the systemic importance of these firms [which included Lehman] therefore provides meaningful incentives to regulatory authorities to prevent such firms’ disorderly failure, given the disruptive effect this would likely have on the derivatives market. Needless to say, when Lehman actually failed, the financial markets were completely unprepared, and therefore panicked. My second observation: This financial crisis was inevitable; saving Lehman would not have averted a financial panic. There's simply no way the financial system could have fully deleveraged without a full-scale financial panic. The financial markets are so complex and interconnected, and the problems were already hidden across so many asset classes, that a deleveraging process was guaranteed to lead to uncontrollable fear at some point. The Lehman failure led to a full-blown panic primarily because it hurt the money market funds so hard. No one thought that the once-sleepy world of money market funds had so much exposure to Lehman. When the Reserve Primary Fund broke the buck, everyone collectively realized just how interconnected—and therefore unpredictable and uncontrollable during a deleveraging cycle—the financial markets really are. My point is that the deleveraging process would have eventually caused large losses in a completely unexpected area of the financial system whether we saved Lehman or not. When contagion can spread faster than investors can get their minds around it, fear replaces rational analysis. So yes, letting Lehman fail was a mistake. But anyone who thinks that if we had just saved Lehman, we could have maintained the necessary trust and confidence in the banking system throughout the entire deleveraging process, is frankly delusional. This financial panic was bound to happen. The fuse was lit years ago. Treasury has agreed to inject an additional $20 billion in capital into Citigroup under terms of the deal hashed out between the bank, the Treasury Department, the Federal Reserve, and the Federal Deposit Insurance Corp. Treasury officials will charge a higher interest rate for the capital injection -- 8% for the first few years -- than it has charged to dozens of other banks now borrowing money under the government's the $700 billion rescue package approved by Congress last month. In addition to the capital, Citigroup will have an extremely unusual arrangement in which the government agrees to backstop a roughly $300 billion pool of its assets, containing mortgage-backed securities among other things. Citigroup must absorb the first $37 billion to $40 billion in losses from these assets. If losses extend beyond that level, Treasury will absorb the next $5 billion in losses, followed by the FDIC taking on the next $10 billion in losses. Any losses on these assets beyond that level would be taken by the Fed. Citigroup would also agree to work to modify -- if possible -- troubled mortgages held in the $300 billion pool, using standards created by the FDIC after the collapse of IndyMac Bank. $306 billion pool of assets to be guaranteed, not $300 billion. Citi will bear the first $29 billion in losses, and the remaining remaining losses will be shared by the government (90%) and Citi (10%). Dividends on common stock in excess of $0.01 per share per quarter are suspended for 3 years, unless the government consents to the dividend. It's unclear whether common stock dividends in the next 3 years will require the consent of the Fed, Treasury, and the FDIC, or some combination thereof. The Federal Reserve Bank of New York, the U.S. Securities and Exchange Commission and the Commodity Futures Trading Commission want information about credit-default swaps that don't conform to standard terms to be disclosed in a central warehouse that would make sure all trades get recorded, said the person, who declined to be identified because the discussions are private. The requirement would provide more detail about the types of contracts that almost drove American International Group Inc. into bankruptcy. My prediction: they will not like what they see. The number of bespoke CDSs is much higher than people commonly believe. But I suspect what will really shock the regulators are the terms of the bespoke CDSs. Some of the (non-standard) amendments the parties add in the Confirmations and Credit Support Annexes are just outrageous. If I get a chance tomorrow, I'll post my favorite amendment I've run across so far (which one trader dubbed the "embedded option to screw your wife"). Investor Wilbur Ross, who made billions turning around distressed steel and textile companies, said a Chapter 11 filing by General Motors Corp. or another U.S. automaker wouldn't work and might devastate the economy. Going to court to reorganize would be "a very inhospitable environment for any of these guys," Ross, 70, said in an interview yesterday. "It would be a total mess." ... "If we were in a different overall economic environment, one of them going down wouldn't necessarily kill" the industry, he said. A weakened economy and frozen debt markets make an automaker bankruptcy impossible, with a Chapter 11 filing for reorganization resulting in liquidation instead, Ross said. It isn't entirely clear why Ross thinks Chapter 11 would be impossible, but the lack of available financing seems to be his main concern. If that's the problem, then instead of lending the Big Three $25 billion to keep them out of Chapter 11, the government should let them file for Chapter 11 and then agree to provide DIP financing. In the run-up to the Depression, Bernanke argued, better leadership could have made a difference. In a November 2002 speech honoring the economist Milton Friedman, Bernanke, already serving on the Fed's board of governors, recounted the tale of Benjamin Strong. As head of the Federal Reserve Bank of New York in the 1920s, Strong opposed the Fed's attempt to curb Wall Street speculation by tightening monetary policy when "there was not the slightest hint of inflation," Bernanke said. But Strong died of tuberculosis in 1928, and his views lost sway. "We don't know what would have happened had Strong lived; but what we do know is that the central bank of the world's economically most important nation in 1929 was essentially leaderless and lacking in expertise," Bernanke lamented. "This situation led to decisions, or nondecisions, which might well not have occurred under better leadership. . . . And associated with these decisions, we observe a massive collapse of money, prices, and output." Of course, if current New York Fed President Tim Geithner becomes the new Treasury Secretary, we won't lose his experience or leadership. But given the vital role the New York Fed plays in policymaking, I doubt Obama will be willing to risk moving Geithner to Treasury while the markets are still in such a precarious position. From Bloomberg: The subtle mockery is priceless. The Federal Reserve is working on a plan that would give it authority to regulate the clearing of trades for the $33 trillion credit-default swap market, according to people with knowledge of the proposal. The Fed, the U.S. Securities and Exchange Commission, the Treasury Department and the Commodity Futures Trading Commission are discussing a memorandum of understanding that lays out oversight of clearinghouses that would become the central counterparty to credit-default swap trades, said the people who asked not to be named because the discussions are private. The SEC and CFTC would also share trading information under the plan, the people said. Everyone knows there will be more regulation of the CDS market soon, but the worry is that each regulator will impose a different regulatory regime, without any coordination, resulting in an onerous patchwork of regulation. If CDS market participants have to navigate a confusing patchwork or regulations, that could damage the liquidity of the market (which is one of the main attractions of CDS right now). Good for the Fed! Michael Lewis has a long piece in Portfolio called "The End of Wall Street's Boom" that I highly recommend. A recurring theme in the piece is that Wall Street financiers just aren't as smart as everyone thinks they are. I couldn't agree more. Virtually no press account of the financial crisis is complete without paying homage to how smart the financiers who got us into this mess are. (Usually the homage is paid by referring to the "financial wizards on Wall Street," or asking how "some of the smartest people in the world" ended up being so terribly wrong?") Wall Street's perceived genius has reached almost mythic proportions, especially among clueless pundits like David Brooks and Sebastian Mallaby. I was never terribly impressed with the overall level of intelligence on Wall Street when I worked there in the '90s. But since returning to Wall Street (or more accurately, Greenwich/Wall Street) a couple months ago, I've been shocked by how many utter morons there are now in financial houses and hedge funds. I've encountered more than a few traders who, when pressed, reveal a very meager understanding of their own product. The one area that seemed to attract genuinely brilliant people back in the late '90s and early '00s was risk management. But no more. Risk management departments are now disproportionately populated by spoiled Harvard legacies with no apparent intellect. All the genuinely smart people I knew on Wall Street back in the day seem to have moved on to hedge funds or retired. I'm not saying there aren't any brilliant people in the big financial houses (there are), I'm just saying that they're the exception rather than the rule. More generally, though, I think the current financial crisis pretty well demonstrates that Wall Street financiers aren't, in fact, "some of the smartest people in the world." I wish the media would put that ridiculous myth to bed. HAVE REALISTIC EXPECTATIONS Plan what must be done to effect the minimum amount of change you’ll be happy with. All politicians basically promise the moon and the stars to their supporters. For any new president, it’s crucial to try to decide what can be reasonably changed — like naming a new Treasury secretary and having higher taxes for the wealthy. Then the president must set to work on those while his prestige and mandate are still fresh and strong. Naming a new Treasury secretary isn't something that Obama may-or-may-not be able to do, depending on his political capital. It's automatic. And with a large Democratic majority in the Senate, confirmation of Obama's nominee will also be automatic. (Yes, potential Treasury secretary Larry Summers made some controversial remarks about women in the sciences a few years ago, but there's absolutely zero chance of that threatening his confirmation.) As for the two leading candidates for Treasury secretary—Larry Summers and Tim Geithner—I sincerely hope that Obama picks Geithner. I met Geithner once a few years ago, and have heard him speak a couple times, and he's very impressive. He's also extremely well-respected on Wall Street. But I think Obama will end up picking Summers instead, primarily because there's no obvious replacement for Geithner at the New York Fed. President of the New York Fed is a critically important position—one which, probably more than any other position, requires someone with the full confidence of Wall Street. Unless William McDonough can be persuaded to come out of retirement, I just can't see Obama plucking Geithner from his position at the New York Fed in the middle of a financial crisis that's driven in large part by a crisis of confidence. Like Yves Smith, I'm not a huge fan of Summers, but people much smarter than I insist that he's a once-in-a-generation mind, so I suppose I'd be content with Summers as Treasury secretary. DTCC: Gross notional total of credit default swaps in DTCC registry is $33.6 trillion. $15.4 trillion in single-name CDS, and $14.8 trillion in CDS linked to indexes. DTCC claims that its registry captures about 90% of the CDS market. That's actually larger than I was expecting, but still much smaller than the numbers constantly cited by the media. Great Day in the Markets. No, Really. Tremendous day in the markets, virtually across the board. In the equity markets, the S&P closed up 4.08% (and over 1000 again! ), the Nikkei surged 6.27%, and the FTSE 100 was up over 4% as well. Almost equally as important, the equity markets traded in a narrow range all day. To that end, the VIX plunged 11.08%, closing below 50 for the first time in over a month. The IG11 was trading around 180bps when I last checked. Treasurys soared, swap spreads were lower, etc. The list goes on. Most notable was the change in sentiment. The abject fear that has characterized the markets since Lehman's failure was nowhere to be found for long stretches of the day. Today's reprieve will almost certainly prove to be temporary, but it was nonetheless a much-welcome breather. 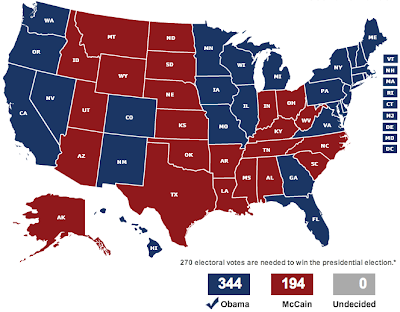 With the first round of exit polls on the horizon, I should get my electoral projection on the record. Here it is: As for the Senate, I see the Democrats picking up 7 seats, bringing their total to 58. Democrats will pick up Virginia, Colorado, New Hampshire, Alaska, New Mexico, North Carolina, and Georgia; however, they'll lose Minnesota and Kentucky. Should be an interesting evening, at least in the Senate. Hedge funds are, by definition, open only to wealthy investors. The entire justification for not requiring hedge funds to register with the SEC is that their clients are supposedly wealthy enough—and therefore sophisticated enough—that they don’t need the protection of the SEC. But now that some US hedge funds have been burned by Lehman Brothers Europe's rehypothecation practices, the hedge funds are crying about how UK law doesn’t protect clients enough! The irony. It’s too much.